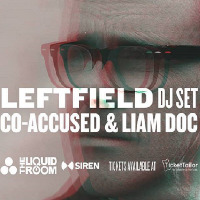 Siren 69 Presents Leftfield, Co-accused and Liam Doc following our sell out Leftfield event at Club 69 Paisley. Leftfield - legend Neil Barnes rips up the sound system with a DJ set. Co-accused - Described by Denis Sulta in Mixmag as “The dream team Co-Accused” Raymond & Lindsay Green hold down a residency at one of the UKs best underground venues The Club aka Club 69 in Paisley. Their music is being supported by Slam, Gary Beck & Carl Cox. With their parties regularly selling out and the launch of their record label in 2019, there's no sign of things slowing down for this exciting new duo! Liam Doc - Over the past 18 months Liam Doc has produced a strong collection of eclectic tracks which have been released on his own imprint, Eyeangle Records and its sub label, Roux Records. In this short time since Liam has been releasing music, he has gathered a lot traction and is regularly played by some of Europe’s top acts, including Denis Sulta and Big Miz. Frequently throwing parties in the infamous Paisley venue “The Club” (formally Club 69), Liam has built up a strong reputation for fierce, energetic sets filled with unique disco cuts, solid house grooves, hard hitting acid and pounding techno. 2018 has been an exciting year for Liam and for Eyeangle, seeing a host of releases curated by the man himself and a busy schedule of parties and festivals across the U.K. Most recently Liam was asked to become a resident of new Glasgow student night “RARE” at the legendary Sub Club. Having already supported the likes of Dixon Avenue Basement Jams, Big Miz and Kornel Kovacs, Liam’s following, reputation and back catalogue have already built a substantial amount of momentum within the early days of his career.